According to the Eureka Springs Times-Echo, June of 1961 was a fairly quiet month in Eureka Springs. The only local topic with extensive coverage was the twelfth season of the Fine Arts Colony at Inspiration Point. With Beaver Dam being built west of town, the inevitable demise of the Mundell community was apparent. The Mundell News column by Mrs. John Schnitzer recorded the preparations for the coming inundation of water. She mentioned that work began to remove the remains of ancestors buried in the Union Chapel Cemetery. She announced that Brother Herman Williams of Busch was going to preach at the Mundell church on the coming Sunday. She noted that it could be the last service held there. I can’t help but wonder what Brother Williams had to say. In other news, future Eureka Springs Fire Chief Wayne Brashear won the essay contest sponsored by the “radio station at Rogers” on the subject, “Why I Should Learn to Drive Safely.” His prize was a week-long stay at the Lake Frances Boys Camp at Siloam Springs. Returning from a week at church camp near Paris, Arkansas were Julia Freeman, Clark Freeman and Butch Berry. During this time, the Basin Theater located at 95 Spring Street was showing movies seven nights per week. Some of the films advertised were The Naked Jungle with Charlton Heston and The Misfits with Clark Gable and Marilyn Monroe. My father used to recall from his younger days that Eurekans wanting a late night meal would drive to Seligman, Missouri to a cafe located there that was open 24 hours per day. That’s why I’m surprised to see an advertisement for McBride’s being “Eureka Springs First All Nite Restaurant.” Perhaps it had something to do with the building of the dam and the new families that moved to town. The first time I heard of the Premier Fire Apparatus Company of Eureka Springs, Arkansas is when Duane O’Connor mentioned that Tommy Walker had seen one of the company’s fire trucks in a museum in Sheridan, Arkansas. The reason that we were even on the topic was because I’d seen an obituary for Minnie Barbee that listed Duane O’Connor as a pallbearer. He told me that Minnie’s husband had owned the fire truck assembly plant that was located on White Street at the top of Owen. Having learned the name “Barbee,” I did what I do: I searched for the name on the internet and looked it up in my paltry collection of reference books. It turns out that Minnie Barbee’s late husband was Roscoe Barbee and he was a big deal, both in Eureka Springs and in the region. He not only owned the Premier Fire Apparatus Company, but he was also in a partnership with Sam Leath for a number of years. (They owned Camp Leath, now the location of Inn of the Ozarks.) On a wider scale, Roscoe Barbee came from a family that was widely known in Missouri politics. Online, I found a copy of Roscoe Barbee’s 1942 Draft Card. From this, I learned that his middle name was Cleveland and that the odds of his being drafted for World War II were slim: he was 57 and had only one leg. I then talked further with Duane O’Connor about Mr. Barbee and his fire truck company. He remembered hearing that the trucks were delivered to Eureka Springs without a body or cab before being outfitted into a fire truck. He recalled a story about one such truck being driven to town in the middle of winter and that the driver was covered with icicles when he arrived. Tommy Walker kindly emailed me a photograph of the sign at the Grant County Museum that described the fire truck that he’d seen on display. It was a 1939 Chevrolet (with a six-cylinder engine) modified by the aforementioned Premier Fire Apparatus Company. The truck was purchased by the city of Sheridan in 1940 and was the first motorized fire truck in Grant County, Arkansas. Photograph of the rig Tex Belt drove in Eureka Springs, Arkansas. Photograph courtesy of Dan Ives. Lately, I’ve been thinking a lot about trees. I do that sometimes. What triggered it this time was a trip to the track behind the Eureka Springs Elementary School. A man stopped me to ask if I had ever seen a chinquapin tree. To be honest, I couldn’t remember if I’d ever seen one or not, but I’ve heard about them all my life. The man showed me one growing in the edge of the woods that skirt the track’s parking lot. He gave me details about the once ubiquitous Ozark Chinquapins and how they were wiped out by blight, similar to what happened to chestnut trees. This led me to thinking about trees and the local forest. Trees have always been important to the western side of Carroll County. I believe that the beauty of our forested hills still help bring in tourists and the cutting of firewood and sawmilling still employ several on a part-time basis. Once upon a time though, this area was part of the largest white oak forest in the world. For decades, millions of trees were cut for stave bolts (for barrel making) and for railroad ties. The 1870 Federal Census was the last census taken before the founding of Eureka Springs and the tourism industry that we now take for granted. Timber was king. If you skim down the occupations listed for the approximately 1,200 locals on this side of the Kings River, you’ll see many lumber jobs and ancillary occupations such as blacksmiths, teamsters, and farriers. All of this thinking of trees led to the memory of a conversation I had with a lady in town years ago. She asked how I could be a tree hugger when my family had cleared more trees than any other family in the history of Eureka Springs. I don’t think that she was correct on either point, but I do like trees. There is a good reason why I don’t live out on the treeless plains or tundra. But, as much as I am fascinated by trees, I still burn them in the woodstove every winter. Alex Weems was born a farm boy in the green hills of east Tennessee. During the Civil War, he lied about his age and joined the Union Army at 14 years old. His cavalry unit was embroiled in three years of combat in several different states. Records indicate that Alex’s lifetime of poor health was linked to his time in the army. After the war, he returned to farming and married his sweetheart Margarett. Times were hard in Tennessee, so the family moved several times, ending up in Salem, Kansas near the Nebraska border. The harsh winter weather on the plains was difficult for Alex. The Weems family lived there when the Great Schoolhouse Blizzard of 1888 hit. The storm was especially destructive because the weather had been mild and many were caught unprepared. It is reported that hundreds became lost in whiteout conditions and froze to death, including many children who had been released from school just as the blizzard hit. At the age of 42, Alex was declared an invalid by the War Department. Life continued though and not for the best. Alex and Margarett’s oldest son James died and was buried at Salem. More than ready to leave this area of Kansas that had held so much difficulty, Alex got a break. A man by the name of Horton traveling through the area stopped and met Alex Weems and they got to talking. The man had an 80 acre farm on Keels Creek in Carroll County, Arkansas. The Ozarks must have sounded like the hills of Alex’s childhood. 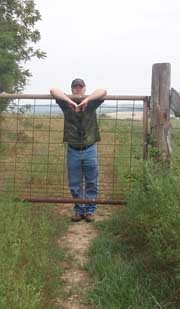 He traded his farm in Kansas for the farm near Eureka Springs sight unseen. Alex and Margarett and their eight children travelled to Arkansas and settled into life on Keels Creek. Two more children were added to the crowded household and the older ones attended the Concord School. They later married into local families. Alex sold the farm to France Johnson in 1911 and the family moved to town. Alex and Margarett are buried in the Eureka Springs Cemetery.